Direct-acting antivirals (DAAs) are known victims (substrate) and perpetrators (cause) of drug–drug interactions (DDIs). These DAAs are used for the treatment of hepatitis C virus (HCV) infections and are highly effective drugs. Drugs used for cardiovascular risk management are frequently used by HCV-infected patients, whom also are treated with DAAs. Therefore, the aim of this review was to describe DDIs between cardiovascular drugs (CVDs) and DAAs. 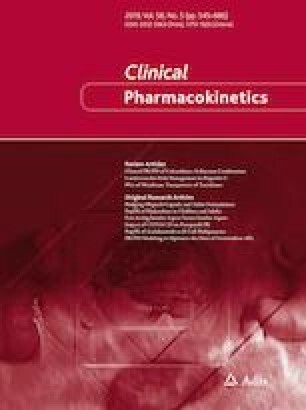 An extensive literature search was performed containing search terms for the marketed DAAs and CVDs (β-blocking agents, ACE inhibitors, angiotensin II antagonists, renin inhibitors, diuretics, calcium channel blockers, statins/ezetimibe, fibrates, platelet aggregation inhibitors, vitamin K antagonists, heparins, direct Xa inhibitors, nitrates, amiodarone, and digoxin). In particular, the drug labels from the European Medicines Agency and the US Food and Drug Administration were used. A main finding of this review is that CVDs are mostly victims of DDIs with DAAs. Therefore, when possible, monitoring of pharmacodynamics is recommended when coadministering these drugs with DAAs. Nevertheless, it is sometimes better to discontinue a drug on a temporary basis (statins, ezetimide). The DAAs are victims of DDIs in combination with bisoprolol, carvedilol, labetalol, verapamil, and gemfibrozil. Despite there are many DDIs predicted in this review, most of these DDIs can be managed by monitoring the efficacy and toxicity of the victim drug or by switching to another CVD/DAA. Drug-drug interactions (DDIs) can be of major concern in hepatitis C patients with cardiovascular issues as there are many potential DDIs. Especially clopidogrel and ticagrelor are drugs of which the potential drug-interactions are complex and hard to manage. With increasing number of new direct-acting antivirals (DAAs) available the number clinical relevant DDIs are decreasing. Direct-acting antivirals (DAAs) used for the treatment of a chronic hepatitis C virus (HCV) infection are known for their drug-interacting potential. They are both substrates and inhibitors/inducers of drug-metabolizing enzymes and drug transporters, making them victims and perpetrators of drug–drug interactions (DDIs) [1, 2, 3]. Numerous papers have shown that HCV patients are polypharmacy patients, meaning that they use high numbers of drugs and a diverse combination of medications [4, 5, 6, 7]. This includes the usual suspects that we would expect in HCV-infected patients, such as immunosuppressive agents (liver transplantation), antiretroviral agents (HIV co-infection), and psychoactive medications, because of the high incidence of mental illnesses. However, drugs used for cardiovascular risk management are also frequently used by HCV-infected patients, e.g., statins (HMG-CoA reductase inhibitors), anticoagulant agents, and antihypertensive drugs [4, 5, 6, 7]. We can explain this by the fact that we are now treating aging HCV-infected patients, and polypharmacy has a positive correlation with age [6, 7, 8]. In addition, extrahepatic manifestations associated with HCV such as diabetes mellitus and renal and cardiovascular disease could be an explanation for the use of these kinds of drugs [9, 10]. To date, there are no published reviews in the literature concerning DDIs between cardiovascular drugs (CVDs) and DAAs, despite the fact that cardiovascular agents are one of the most frequently prescribed drugs . For drug interactions with DAAs, the scientific community has focused on the most commonly prescribed drugs in HCV patients. However, in daily practice, clinical pharmacists are frequently asked many questions about combining DAAs with anticoagulation agents, ACE inhibitors, β-blockers, and statins. Some interactions are easy to manage (monitoring blood pressure), whereas others are highly complex due to the metabolic profile of the DAAs and the CVD (e.g., clopidogrel). This is, for instance, reported by de Lorenzo-Pinto et al. , who reported a significantly increased acenocoumarol dose because of the interaction with paritraprevir/ritonavir, ombitasvir, and dasabuvir (PrOD). Comparable interaction was seen with warfarin, resulting in a subtherapeutic international normalized ratio (INR) during concomitant treatment with PrOD . Both of these cases showed that there were significant DDIs between anticoagulants and PrOD, making increased monitoring necessary. Other case reports describing severe bradycardia, which even caused death, were reported in patients using amiodarone in combination with sofosbuvir and NS5A inhibitors. This was an unexpected DDI, showing that not all DDIs can be predicted [12, 13]. This review aims to provide clinical guidance to cardiologists managing CVDs when patients are treated with DAAs, hepatologists/infectious disease specialists, and also to other physicians, such as general practitioners, who are now allowed to prescribe the DAAs. All of these physicians should have detailed knowledge of the pharmacotherapy of both disease areas and should be able to choose the appropriate DAA regimen with the least number of DDIs for these patients. The review begins by describing the drug metabolism of DAAs and CVDs and presenting the in vivo drug interactions found in the literature. Next, drug interactions between DAAs and CVDs are predicted based on drug metabolism and drug transport, which are accompanied with recommendations for clinical decision-making. The DAAs included in this descriptive review are the protease inhibitors grazoprevir, glecaprevir, paritaprevir, simeprevir, and voxilaprevir, the NS5A inhibitors daclatasvir, elbasvir, pibrentasvir, ledipasvir, ombitasvir, and velpatasvir, and the NS5B polymerase inhibitors dasabuvir and sofosbuvir. The CVDs included can be grouped into the following classes: antihypertensive agents, anticoagulation agents, antithrombotic agents, antiarrhythmic agents, and lipid-lowering agents. All included drugs are listed in Table 1. For this review, we aimed to select the most commonly prescribed agents in Europe and the USA. This selection was based on clinical experience of the pharmacists EJS, PJGtH, and DMB. An extensive literature search was performed in January 2018. Search terms contained both generic and brand names of the selected drugs given in Tables 1 and 2 and all searches were performed in English. These drug names were combined with the search terms ‘drug-drug interaction’ or ‘pharmacokinetics’. We searched PubMed (1946–January 2018) to identify peer-reviewed studies. In addition, information from the Summary of Product Characteristics (SmPC) approved by the European Medicines Agency (EMA) and the Prescribing Information approved by the US Food and Drug Administration (FDA) were used. The Google and Google Scholar search engines, ClinicalTrials.gov (http://www.clinicaltrials.gov) website, and the Liverpool drug interaction database (http://www.hep-druginteractions.org) were also used to identify conference posters and abstracts. To understand and predict DDIs, knowledge of pharmacokinetics and pharmacodynamics is crucial. Pharmacokinetics is described by the absorption (after oral administration), distribution, metabolism, and elimination (ADME) of a drug (Fig. 1). The goal during drug therapy is to maintain the plasma concentration within a therapeutic range (therapeutic window), which balances efficacy and toxicity (Fig. 2a). Pharmacogenetic variations in drug-metabolizing enzymes and drug transporters (polymorphisms), food and lifestyle, adherence to drugs, or drug interactions can result in variable plasma concentrations of drugs (inter-subject variability). Concerning drug interactions, these can take place at all the four phases of ADME, altering the pharmacokinetic profile of another drug (Fig. 3). In this review, we focus particularly on this type of pharmacokinetic drug interaction. 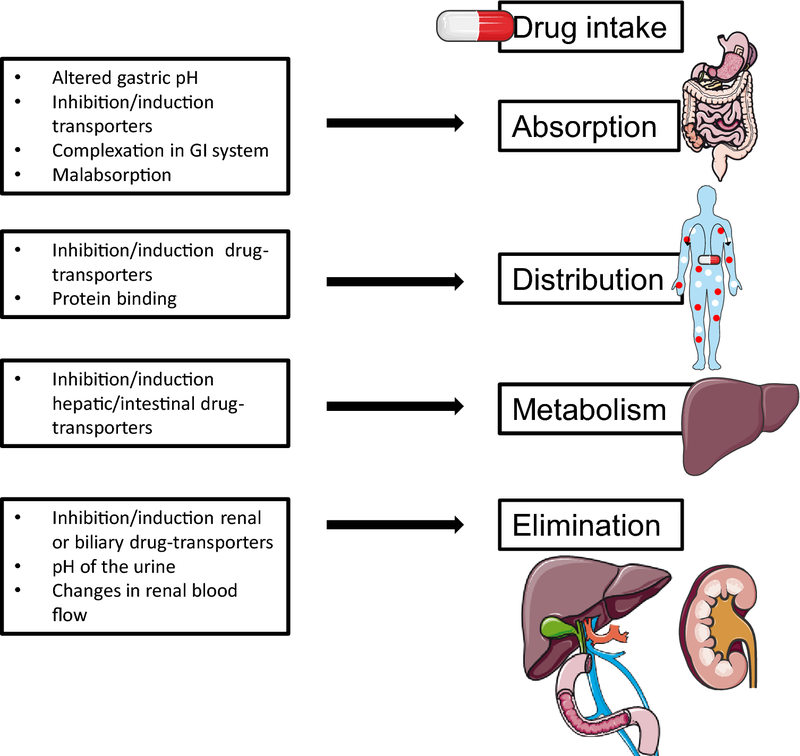 Overview of various pharmacokinetic mechanisms of drug–drug interactions. GI gastrointestinal. The most important drug-metabolizing enzymes for DDIs are phase I (cytochrome P450 [CYP] enzymes) and phase II (uridine 5′-diphospho-glucuronosyltransferase [UGT] enzymes [conjugation]). These enzymes can be inhibited and induced by other drugs (perpetrators) influencing the plasma concentration of the substrate (victim drug) (Fig. 1). Comparably, influx and efflux drug transporters are involved in drug interactions as they can also be inhibited or induced by other drugs. Also, the location of the transporter and the direction of transport determine the net result of the drug interaction (substrates plasma concentration) . For both enzymes and transporters, several polymorphisms are known that are genetic variations influencing the activity of the affected enzyme or transporter. For example, for CYP2D6 several phenotypic polymorphisms are described: poor, extensive, rapid, and ultra-rapid metabolizers. CYP2D6 is involved in the metabolism of, for example, metoprolol and propranolol. These polymorphisms should also be considered in respect to drug interactions. For example, in patients that are poor metabolizers of CYP2D6, using a drug that inhibits CYP2D6 is not clinically relevant, as limited metabolism of CYP2D6 takes place . As already noted, the DAAs are known for DDIs in HCV treatment as these drugs are both substrates and inhibitors/inducers of various drug-metabolizing enzymes and drug transporters (Table 2). The magnitude of the net effect of this interaction, expressed as the percentage increase of the decrease of, for example, the area under the plasma concentration–time curve(AUC) (total exposure), is important in the interpretation of drug interactions. Another important aspect is that the magnitude of the interaction must be interpreted in light of the therapeutic range of a victim drug (Fig. 2b). One can imagine that for drugs with a narrow therapeutic range (e.g., amiodarone, digoxin), a moderate drug interaction is of bigger influence than drugs with a wide therapeutic range (the DAAs in general). For most CVDs discussed in this review, no therapeutic range is defined (Table 1). These drugs are usually administered on clinical response, for example by measuring blood pressure or cholesterol. In this section we discuss the different classes of CVDs and the factors that make CVDs victims or perpetrators of drug interactions. We explain the mechanisms of the (proposed) drug interactions and discuss the clinical relevance. 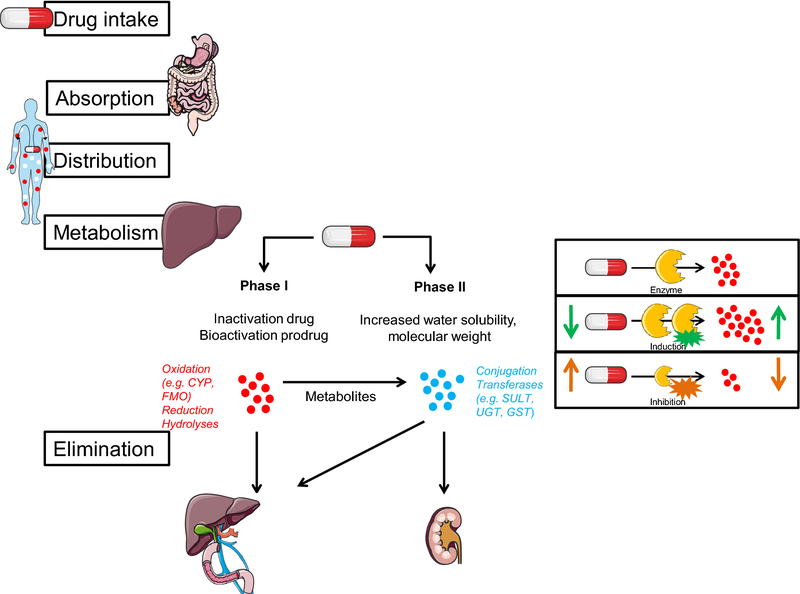 Table 1 provides an overview of the selected CVDs and their influence on drug-metabolizing enzymes and drug transporters, as well as the enzymes and drug transporters that are responsible for their metabolism or transport. The same information is given for the DAAs in Table 2. Table 3 presents all known drug interactions that have been studied in vivo between DAAs and CVDs. The magnitude of the drug interaction is presented as the geometric mean ratio (GMR) with 90% confidence intervals of the AUC, maximum (peak) plasma concentration (Cmax), and minimum (trough) plasma concentration (Cmin). We also make predictions for those cases where no in vivo drug interaction studies were found. In the following sections we explain, based on studies in humans and on predictions, which combinations of CVDs and DAAs can be safely used, how DDIs can be managed, and which drugs are contraindicated when using DAAs. Table 4 describes the clinically relevant DDIs and the recommended management for these. Monitor the patient heart rate and blood pressure. Based on the metabolism of bisoprolol, carvedilol, and labetalol, we believe there are DDIs with DAAs (Table 1). For example, carvedilol is a substrate of, among others, CYP2C19, CYP2D6, and P-glycoprotein (P-gp) and the metabolites are glucuronidated. Therefore, a DDI is expected with all the DAAs, except sofosbuvir alone. As carvedilol also inhibits P-gp, the plasma concentrations of daclatasvir, glecaprevir/pibrentasvir, simeprevir, and ledipasvir may rise when combined with carvedilol . This makes monitoring of DAA toxicity advisable, especially for the protease inhibitors simeprevir, glecaprevir, and paritaprevir as, for example, (severe) skin reactions might occur. Boglione and colleagues  recently showed that these skin reactions were related to the simeprevir plasma concentration. Therefore, especially for simeprevir, these kinds of interactions could cause extra toxicity . Sofosbuvir is also a P-gp substrate; however, it is rapidly metabolized and its primary metabolite GS-331007 is not a substrate of P-gp [18, 19]. So, we expect that carvedilol P-gp inhibition does not influence the toxicity profile of sofosbuvir and its metabolites. The drug interaction between metoprolol and daclatasvir/asunaprevir/beclabuvir has been studied in vivo  (Table 3); however, this regimen is not licensed in Europe and the USA. Garimella and colleagues  showed that asunaprevir affected the metoprolol plasma concentration as it is a moderate inhibitor of CYP2D6. In vitro experiments have shown that daclatasvir is not an inhibitor of CYP2D6 [20, 21, 22]. PrOD is a mild inhibitor of CYP2D6, so there is a theoretical interaction between CYP2D6 substrates, such as metoprolol and propranolol, with this combination. We recommend care be taken in combining paritaprevir/ritonavir, ombitastir with or without dasabuvir PrO(D) with CYP2D6 substrates with narrow therapeutic ranges. This is based on the drug interaction study between PrOD and duloxetine (CYP2D6/CYP1A2 substrate), which was performed to study CYP2D6 inhibition and CY1A2 induction by ritonavir. Duloxetine was not influenced by PrOD [23, 24, 25]. However, it can be argued that CYP2D6 inhibition was mitigated by CYP1A2 induction . This should be taken into consideration when PrOD is combined with other CYP2D6 substrates, especially those with narrow therapeutic ranges (which is not the case for metoprolol and propranolol). This should also be taken into account in patients with known CYP2D6 phenotypic polymorphisms. In patients that are poor metabolizers of CYP2D6, this interaction is not relevant. However, in patients with rapid or extra-rapid metabolism, the interaction could be relevant as the metoprolol or propanol concentrations could increase compared with those without the DDI. No DDIs studies were found regarding ACE inhibitors and DAAs. The only clinical relevant DDI that we predict is with enalapril, a substrate of organic anion transporting polypeptide (OATP). OATP is inhibited by almost all DAAs, such as daclatasvir, velpatasvir, and PrO(D) (Table 4) . We do not expect a clinically relevant DDI between captopril (CYP2D6 substrate) and PrO(D) because captopril does not have a narrow therapeutic range . Losartan and valsartan (OATP substrates) have both been studied with glecaprevir/pibrentasvir. The valsartan AUC and Cmax increased by 31 and 36%, respectively, due to OATP inhibition by glecaprevir. Comparably, the losartan AUC and Cmax increased by 56 and 151%, respectively, when combined [28, 29]. The FDA label states that these DDIs are not clinically relevant and that no dose adjustments are necessary when these drugs are combined. Irbesartan, olmesartan, and telmisartan are also substrates of OATP and therefore comparable DDIs are expected. This is probably a group effect for all angiotensin II antagonists [30, 31]. Therefore, these angiotensin II antagonists could have DDIs with DAAs that influence these OATPs, such as daclatasvir, glecaprevir, pibrentasvir, paritaprevir, simeprevir, velpatasvir, and voxilaprevir (Table 2). Losartan is also a substrate of CYP2C9 and CYP3A4; however, these enzymes are responsible for 14% of its bio-activation into a more pharmacologically active metabolite . As this is only a small amount, we do not expect a clinical relevant DDI between losartan and, for example, PrOD. The renin inhibitor aliskiren is a CYP3A4, P-gp, and OAPT1B1 substrate. Aliskiren has not been studied with any of the DAA regimens; however, it is widely shown in the literature that aliskiren pharmacokinetics are affected by inhibitors of these enzymes and transporters [33, 34, 35, 36]. For example, in combination with itraconazole (CYP3A4 and P-gp inhibitor) the steady-state AUC and Cmax of aliskiren increased 6.5- and 5.8-fold , and with ciclosporin (cyclosporine) (CYP3A4 and P-gp inhibitor) the AUC and Cmax increased ~ 2.5- and ~ 5-fold, respectively . Therefore, aliskiren is contraindicated with glecaprevir/pibrentasvir and PrO(D) and not recommended with daclatasvir, ledipasvir/sofosbuvir, and simeprevir. The only two diuretics listed in Table 2 that might have a DDI are furosemide and eplerenone. Furosemide was studied in combination with PrOD. Furosemide is glucuronidated and the study showed that, in particular, the Cmax increased by 50% as paritaprevir, ombitasvir, and dasabuvir all inhibit UGT1A1 [23, 37]. Thus, the label recommends monitoring of, for example, the patient’s blood pressure and reduction of the dose by 50% when necessary. Eplerenone (aldosterone antagonist) is involved in DDIs as it is metabolized by CYP3A4. As no interaction studies were found with eplerenone and many of the DAAs inhibit CYP3A4, we advise care be taken and that treatment be initiated with a lower dose (e.g., 50% reduced) when combined with grazoprevir/elbasvir, glecaprevir/pibrentasvir, and simeprevir. The drug is contraindicated with the ritonavir-containing regimens . The calcium antagonist verapamil is an inhibitor of P-gp, making it a perpetrator of DDIs with P-gp substrates, which are almost all DAAs (Table 2). When verapamil and DAAs are combined it is recommended that the side effects of the DAAs be monitored. It should be mentioned that most DAAs have a wide therapeutic range and have a favorable safety profile, so this interaction is probably not clinically relevant. In general, calcium channel blockers are CYP3A4 substrates and therefore have DDIs with the DAAs that inhibit this enzyme. So, it is advisable that the heart rate and blood pressure be monitored when patients are treated with both calcium channel blockers and DAAs. Paritaprevir exposure was reduced ~ 20% in combination with amlodipine, but this was not considered to be clinical relevant. The same study found that amlodipine AUC and Cmax values increased by 157 and 26%, respectively [23, 37]. Therefore, we recommend reducing the amlodipine dose by 50% when PrOD is started. Felodipine is a CYP3A4 substrate and has been studied in combination with the weak CYP3A4 inhibitors glecaprevir/pibrentasvir. Felodipine exposure rose by 31%, which was considered not to be clinical relevant (AUC increased 31%; Cmax increased 31%) and no precautions are necessary when combining these drugs [28, 29]. Verapamil is also a victim of DDIs with almost all DAAs as it is a substrate of CYP3A4 and P-gp. The plasma concentration of verapamil can be increased by, for example, daclatasvir, grazoprevir, elbasvir, glecaprevir, and pibrentasvir . Therefore, patients using verapamil should be monitored for side effects of verapamil (blood pressure, heart rate). The statins are definitely the most frequently studied drugs in combination with DAAs. All of the DAAs (except sofosbuvir alone) have pharmacokinetic interactions with the different statins. For example, simvastatin was studied in combination with simeprevir, which increased the AUC and Cmax of simvastatin by 51 and 46% . This is caused by intestinal CYP3A4, OATP1B1/3, and P-gp inhibition by simeprevir, as simvastatin is a substrate of these enzymes and transporters. Therefore, when simvastatin is combined with simeprevir, the dose of simvastatin should be reduced and the patient should be monitored carefully. Even more profound increases in AUC and Cmax were observed when atorvastatin was combined with grazoprevir (2- and ~ 6-fold , respectively) and glecaprevir/pibrentasvir (~ 8- and 22-fold, respectively [28, 29, 41, 42]). As all statins are substrates of various drug transporters and drug-metabolizing enzymes that are inhibited by DAAs, this results in a clinically relevant increase in statin plasma concentrations. These interactions must be managed at the start of HCV therapy because of the severe adverse reactions that can be expected with increased statin plasma concentrations. The risk relating to high exposure to statins has been discussed previously in different case reports [43, 44, 45, 46, 47, 48, 49, 50], describing severe myopathy or even rhabdomyolysis, which is a potentially life-threatening condition. Therefore, for all statins we recommend that physicians take care when combining these drugs with DAAs. At the very least treatment should be initiated using the lowest dose; however, when possible in patients with a low risk of atherosclerotic cardiovascular diseases, another option is to discontinue the statin during the 8–12 weeks of HCV treatment. Ezetimibe is not a statin, but is a substrate of OATP1B1 and could therefore have drug interactions with daclatasvir, simeprevir, glecaprevir/pibrentasvir, PrO(D), and sofosbuvir/velpatasvir/voxilaprevir. We also recommend discontinuing ezetimibe during DAA therapy. The fibrate gemfibrozil has been studied in combination with PrOD as it strongly inhibits CYP2C8 and CYP2C9. This is one of the rare cases in which the CVD is the perpetrator of a DDI and the DAA is the victim, because dasabuvir is a CYP2C8 substrate. When combined with gemfibrozil 1200 mg the dasabuvir AUC increased 11-fold and the Cmax 2-fold. As a result, gemfibrozil is contraindicated in combination with PrOD . As with statins, one could consider discontinuing gemfibrozil when dasabuvir is necessary. Gemfibrozil did not influence paritaprevir and ritonavir plasma concentrations in a clinically relevant extent. Thus, as gemfibrozil solely affected dasabuvir concentrations, and ombitasvir is not a CYP2C8/9 substrate, it can be used in combination with paritraprevir/ritonavir and ombitasvir (PrO; i.e., without dasabuvir) . Gemfibrozil is also a minor CYP3A4 substrate; its plasma concentration could decrease during therapy, which is shown in combination with lopinavir/ritonavir . Busse and colleagues  described that steady-state AUC and Cmax values for gemfibrozil were decreased by 41 and 33% in combination with lopinavir/ritonavir. We recommend that when gemfibrozil is combined with PrO or other CYP3A4 inhibitors, the lipid profile of the patient should be monitored. But, again, it is probably best to discontinue the fibrate. No DDIs are expected with acetylsalicylic acid; however, drug interactions are definitely predicted with the other drugs from this class, but no DDI studies were identified. We expect DDIs between PrO(D) and clopidogrel, prasugrel, and ticagrelor, as CYP3A4 and CYP2C19 are involved in the bio-activation of clopidogrel and prasugrel and metabolism of ticagrelor [52, 53, 54, 55, 56]. As clopidogrel and prasugrel are both prodrugs with complex drug metabolism [57, 58], the pharmacokinetic relevance of these DDIs is hard to predict. When these enzymes are inhibited by ritonavir (in PrOD), it could mean that a less active metabolite is formed, causing a reduced effect on the platelet aggregation. As clopidogrel, prasugrel, and ticagrelor have not been studied with the DAAs, we now present information from other DDI studies with, amongst others, CYP3A4 inhibitors. This is done to provide more information about the influence of enzyme inhibition in combination with the complex metabolism of clopidogrel and prasugrel. Farid and colleagues  studied the DDIs when clopidogrel and prasugrel were given with ketoconazole. These drugs were administered to healthy volunteers and it was shown that ketoconazole decreased the Cmax of the active metabolite of both prasugrel and clopidogrel by 34 and 61%, respectively. The AUC of the active metabolite of clopidogrel was also affected when combined with ketoconazole as it was 29% decreased. This influenced the inhibition of the platelet aggregation (pharmacodynamics). The AUC of the active metabolite of prasugrel was not affected and there was also no influence on the inhibition of the platelet aggregation . These findings are strengthened by a phase I study in healthy volunteers and HIV-infected patients where the boosted protease inhibitors ritonavir and cobicistat were administered to subjects in combination with prasugrel and clopidogrel . After a dose of clopidogrel 300 mg and ritonavir 100 mg or cobicistat 150 mg the AUC from time zero to 4 h (AUC4) and Cmax of the clopidogrel active metabolite decreased from 80.5 to 25.1 ng∙mL/h and 55.9 to 17.3 ng/mL, respectively. This decrease in AUC and Cmax influences the pharmacodynamics as platelet inhibition was insufficient in 44% of the HIV-infected patients. Almost all healthy volunteers had sufficient platelet inhibition as they were not using a CYP3A4 inhibitor. Comparably, the AUC4 and Cmax of the active metabolite of prasugrel were decreased from 414 to 200 ng mL/h and 362 to 207 ng/mL, respectively. Similar to the study of Farid et al. , this did not influence the pharmacodynamics of prasugrel as both healthy volunteers and HIV-infected patients had sufficient platelet inhibition. The authors argue that this is caused by the fact that prasugrel is a more potent platelet inhibitor then clopidogrel . When we extrapolate the results of these two studies to the HCV-infected population, we believe prasugrel is the best choice in combination with ritonavir, and thus combination of prasugrel is also possible with the DAA-inhibiting CYP3A4 (e.g., PrO(D), simeprevir). The pharmacokinetics of ticagrelor have also been studied in combination with CYP3A4 inhibitors (diltiazem and ketoconazole) . Diltiazem and ketoconazole both inhibit CYP3A4 and P-gp and could therefore possibly affect ticagrelor exposure and thus also the pharmacodynamics. Ticagrelor itself is a direct-acting antiplatelet agent; however, it has also active metabolites. The moderate CYP3A4 and P-gp inhibitor diltiazem increased the ticagrelor Cmax and AUC by 69 and 174%, respectively. Understandably, the Cmax and AUC of the active metabolite were decreased (38 and 13%, respectively). Comparable but more extreme results were found with the strong CYP3A4 inhibitor ketoconazole: Cmax and AUC were increased by 135 and 532% and these values for the active metabolite was decreased by 89% and 56%, respectively. The influence on the pharmacodynamics was not part of the study in healthy volunteers . This study showed that CYP3A4 inhibitors, both moderate and strong, are not recommended in combination with ticagrelor. This same effect was studied in a physiologically based pharmacokinetic (PBPK) model showing that a reduced dose of ticagrelor 45 mg (instead of 90 mg) could be adequate in combination with ritonavir. However, this has not yet been studied in vivo . Based on these published drug interaction studies between clopidogrel, prasugrel, and ticagrelor and CYP3A4 inhibitors, we advise that these drugs not be used in combination with, for example, PrOD and simeprevir (also CYP3A4 inhibitors), but instead that another DAA combination be used or to switch to, for example, acetylsalicylic acid. However, in the exceptional situation in which both a platelet inhibitor other than acetylsalicylic acid is needed and PrOD or simeprevir is indicated, the preferred platelet aggregation inhibitor would be prasugrel. Acenocoumarol, phenprocoumon, and warfarin are all metabolized by CYP enzymes such as CYP2C9, CYP1A2, and CYP3A4 (Table 1). Phenprocoumon is also glucuronidated. These enzymes can be influenced by different DAAs, causing DDIs as presented in Table 2. Acenocoumarol and phenprocoumon have not been studied in vivo with DAAs, but warfarin has been studied in combination with PrOD and simeprevir. The GMR and Cmax of S-warfarin was not influenced by simeprevir . Comparable results are found for both R- and S-Warfarin, after a dose of warfarin 5 mg, when combined with PrOD. For this combination, the label advises that the dose of warfarin should not be altered, but that the INR should be monitored during DAA treatment . DDIs with vitamin K antagonists can be managed easily, as the INR can be easily and frequently monitored. No DDI studies were found and no CYPs are involved in the metabolism of heparin, nadroparin, dalteparin, and enoxaparin, and therefore no DDIs are expected. The direct factor Xa inhibitors have all been marketed recently and therefore adequate information is available regarding drug metabolism and drug interactions. All direct factor Xa inhibitors are P-gp substrates, making them victims of DDIs. This resulted in an increased dabigatran AUC and Cmax when combined with glecaprevir/pibrentasvir of 138 and 105%, respectively [28, 29]. Comparable numbers were also found when dabigatran was combined with sofosbuvir/velpatasvir/voxilaprevir as AUC and Cmax values were elevated by 161 and 187%, respectively [61, 62]. These increased plasma concentrations, which could potentially cause extreme bleeding, are the reason why dabigatran is contraindicated with both glecaprevir/pibrentasvir and sofosbuvir/velpatasvir/voxilaprevir. As all other available DAA regimens also inhibit P-gp, dabigatran should be used with caution in combination with all DAAs. Switching to other anticoagulation therapy would possibly be best in these cases. No DDI studies were found involving DAAs and the other direct factor Xa inhibitors, but based on metabolism and studies with other P-gp inhibitors the recommendations are the same as for dabigatran regarding P-gp inhibition. The exception is edoxaban, which, according to its label, is contraindicated with sofosbuvir/velpatasvir/voxilaprevir; one of the active metabolites of edoxaban is a substrate of OATP1B1, which is inhibited by both velpatasvir as voxilaprevir. Also, some other DAAs inhibit both P-gp and OATP1B1, and precribers should be careful when using DAAs together with edoxaban. When combining edoxaban with PrO(D) and glecaprevir/pibrentasvir, a reduced dose of 30 mg can also be considered; however, this has not been studied and is not recommended by the edoxaban label. Body weight (< 60 kg) and renal function should be considered when reducing the dose . As well as being a P-gp substrate, both apixaban and rivaroxaban are also CYP3A4 substrates. Thus, these drugs are contraindicated with PrO(D) as their labels contraindicate strong CYP3A4 substrates and P-gp inhibitors, such as ritonavir. For example, the steady-state exposure of apixaban and its Cmax were elevated by 2- and 1.6-fold, respectively, when combined with ketoconazole [64, 65]. The nitrates are hepatically metabolized (Table 1), but no CYPs are involved (as far as we know). Therefore, it is not expected that there will be any drug interactions between the nitrates and DAA regimens. We found no studies of DDIs between the DAAs and amiodarone. However, amiodarone is contraindicated with all sofosbuvir-based regimens. This is based on an FDA warning and case reports describing extreme bradycardia and even death in patients treated with sofosbuvir-based regimens together with amiodarone [12, 66, 67, 68]. The exact mechanism of the DDI is still unknown [69, 70, 71, 72, 73, 74], but several in vitro and in vivo studies have been performed with the aim of understanding this severe, and widely discussed, drug interaction. For example, Lagrutta et al. recently published data showing a pharmacodynamic interaction between sofosbuvir (l-Ala diastereoisomer) and amiodarone. When sofosbuvir was coadministered with amiodarone an increased beating rate and decreased beat amplitude in pluripotent stem cell-derived cardiomyocytes was observed. This finding was confirmed in Dunkin-Hartley guinea pigs. The authors show that the interaction between NS5B polymerase inhibitors is dependent of the diastereochemistry of the specific drugs, which showed no alterations in rate and amplitude when they studied MK-3682 (d-Ala diastereoisomer) . As the precise mechanism and the DAA that caused the drug interaction is not totally clear, all sofosbuvir-containing regimens are contraindicated with amiodarone. No DDIs or assumed mechanisms are known for elbasvir/grazoprevir and glecaprevir/pibrentasvir, so these DAA regimens may be combined with amiodarone. We do, however, recommend being careful as little is known about the amiodarone interaction with the sofosbuvir-based regimens and this severe drug interaction was also not predicted by drug metabolism or drug transport. Digoxin is probably the best studied drug in combination with DAAs, as shown in Table 3. Digoxin is a P-gp substrate and often used in DDI studies as a ‘P-gp probe’. Digoxin has been studied in combination with daclatasvir, simeprevir, elbasvir/grazoprevir, glecaprevir/pibrentasvir, PrO(D), and velpatasvir. When P-gp is inhibited, absorption is increased, resulting in higher Cmax values. This is also shown in the different DDI studies with the DAAs (Table 3). For example, in combination with elbasvir/grazoprevir the AUC and Cmax of digoxin increased by 11 and 47%, respectively . In comparison, when combined with velpatasvir the AUC and Cmax increased by 34 and 88%, respectively . For this reason, digoxin can be coadministered with DAAs with frequent monitoring of digoxin plasma concentrations, especially when digoxin is started during DAA therapy. It is advised to start with the lowest possible digoxin dose. When starting DAA therapy while on digoxin, an increase in the digoxin Cmax is expected, as the DAAs have the biggest influence on the Cmax (absorption phase). Therefore, we recommend that the intake of the DAAs and digoxin be separated as the data show a limited influence on the AUC, therefore suggesting that when the intake of the drug is separated the magnitude of the interaction might be reduced. This concept has not yet been studied, but we recommend this to our patients who are in need of both digoxin and DAA therapy. Of course, consulting a cardiologist for a baseline ECG is a must in these cases in combination with measuring the digoxin toxicity and plasma concentrations. In this descriptive review we aimed to provide an overview of all known DDIs between selected CVDs and the DAAs licensed in Europe and the USA and to give recommendations to aid clinical decision-making for clinical pharmacologists managing the DDIs together with prescribers. Our most significant finding was that there are few in vivo drug interactions studies between the two drug classes. Most DDI studies used for this review were found in the drug labels and not in other publications or posters in the public domain. Thus, few DDI studies have been performed after licensing. One could argue that for the frequently prescribed drugs such as clopidogrel, prasugrel, and ticagrelor there is a need for DDI studies with the DAAs. This could be in the form of clinical studies, but more and more frequently modeling and simulation (in silico) studies are undertaken to evaluate drug interactions. For example, PBPK modeling is a frequently used approach for studying DDIs in silico [72, 76], reducing the number of in vivo drug interaction studies needed. Throughout this review, many drug interactions are described that are the result of the ritonavir in the PrO(D) combination. It should be noted that with the introduction of newer DAA regimens such as sofosbuvir/velpatasvir with or without voxilaprevir and glecaprevir/pibrentasvir the number of clinically relevant drug interactions will reduce significantly because these regimens have more favorable drug interaction profiles. Still, these newer DAAs are also involved in drug interactions (Tables 3 and 4) and do not obviate the risk of DDIs with CVDs. Most DDIs can be managed easily in daily practice by monitoring the efficacy and toxicity of the victim drug, switching to another CVD in the same class, or switching to another DAA. Another interesting finding is that, in general, the CVDs are the victims of the DDIs. Thus, monitoring of blood pressure, low-density lipoprotein, and the INR is recommended when coadministering these drugs with DAAs. Nevertheless, it is sometimes probably just better to discontinue a drug on a temporary basis (i.e., statins). The DAAs are victims of the DDIs in combination with, for example, verapamil and gemfibrozil, for which alternative options are given. In addition, the DAAs in general have a wide therapeutic range, so when the plasma concentration is decreased or increased we do not expect severe loss of efficacy or toxicity. In conclusion, this review provides an overview of the mechanisms of drug interactions between CVDs and DAAs. We used interaction studies to make predictions regarding possible DDIs and provide advice on how to handle these predicted drug interactions. It would be best if, in the future, these predictions are strengthened with data from in vivo drug interaction studies in order to safely optimize treatment of HCV patients with DAAs. EJS declares having received travels grants from Abbvie and Gilead. SW and PJGTH declare that they have no conflicts of interest that are directly relevant to the content of this review. DMB is on the advisory boards for AbbVie, BMS, Gilead, Janssen, and Merck and received sponsorship/research grants from BMS, Gilead, Janssen, Merck, and Viiv. However, these conflicts of interest did not influence the preparation of this review. No funding was used in the preparation of this review. FDA. Coreg: prescribing information. https://s3-us-west-2.amazonaws.com/drugbank/fda_labels/DB01136.pdf?1265922801. Accessed 6 Mar 2018. EMA. Sovaldi: summary of product characteristics. 2014. http://www.ema.europa.eu/docs/en_GB/document_library/EPAR_-_Product_Information/human/002798/WC500160597.pdf. Accessed 7 Mar 2018. FDA. Sovaldi: prescribing information. 2014. http://www.accessdata.fda.gov/drugsatfda_docs/label/2014/204671s001lbl.pdf. Accessed 7 Mar 2018. EMA. Daklinza: summary of product characteristics. 2015. http://www.ema.europa.eu/docs/en_GB/document_library/EPAR_-_Product_Information/human/003768/WC500172848.pdf. Accessed 7 Mar 2018. FDA. Daklinza: prescribing information. 2015. http://www.accessdata.fda.gov/drugsatfda_docs/label/2015/206843Orig1s000lbl.pdf. Accessed 7 Mar 2018. EMA. Viekirax: summary of product characteristics. 2015. http://www.ema.europa.eu/docs/en_GB/document_library/EPAR_-_Product_Information/human/003839/WC500183997.pdf. Accessed 7 Mar 2018. FDA. Viekira Pak: prescribing information. 2014. https://www.accessdata.fda.gov/drugsatfda_docs/label/2014/206619lbl.pdf. Accessed 7 Mar 2018. EMA. Norvir: summary of product characteristics. 2014. http://www.ema.europa.eu/docs/en_GB/document_library/EPAR_-_Product_Information/human/000127/WC500028728.pdf. Accessed 30 Jun 2016. EMA. Maviret: summary of product characteristics. 2017. http://www.ema.europa.eu/docs/en_GB/document_library/EPAR_-_Product_Information/human/004430/WC500233677.pdf. Accessed 7 Mar 2018. FDA. Mavyret: prescribing information. 2017. https://www.accessdata.fda.gov/drugsatfda_docs/label/2017/209394s000lbl.pdf. Accessed 7 Mar 2018. FDA. Hyzaar: prescribing information. 2011. https://www.accessdata.fda.gov/drugsatfda_docs/label/2011/020387s052lbl.pdf. Accessed 6 Mar 2018. EMA. Exviera: summary of product characteristics. 2015. http://www.ema.europa.eu/docs/en_GB/document_library/EPAR_-_Product_Information/human/003837/WC500182233.pdf. Accessed 7 Mar 2018. FDA. Inspra: prescribing information. 2002. https://www.accessdata.fda.gov/drugsatfda_docs/label/2016/021437s013lbl.pdf. Accessed 6 Mar 2018. FDA. Verelan: prescribing information. 2014. https://www.accessdata.fda.gov/drugsatfda_docs/label/2014/019614s050lbl.pdf. Accessed 6 Mar 2018. EMA. Olysio: summary of product characteristics. 2014. http://ec.europa.eu/health/documents/community-register/2014/20140514128513/anx_128513_en.pdf. Accessed 7 Mar 2018. EMA. Zepatier: summary of product characteristics. 2016. http://www.ema.europa.eu/docs/en_GB/document_library/EPAR_-_Product_Information/human/004126/WC500211235.pdf. Accessed 7 Mar 2018. FDA. Zepatier: prescribing information. 2016. http://www.accessdata.fda.gov/drugsatfda_docs/label/2016/208261Orig1s000lbl.pdf. Accessed 7 Mar 2018. EMA. Plavix: summary of product characteristics. 2008. http://www.ema.europa.eu/docs/en_GB/document_library/EPAR_-_Product_Information/human/000174/WC500042189.pdf. Accessed 6 Mar 2018. FDA. Plavix: prescribing information. 2009. https://www.accessdata.fda.gov/drugsatfda_docs/label/2009/020839s044lbl.pdf. Accessed 6 Mar 2018. FDA. Effient: prescribing information. 2009. https://www.accessdata.fda.gov/drugsatfda_docs/label/2010/022307s002lbl.pdf. Accessed 6 Mar 2018. EMA. Efient: summary of product characteristics. 2009. http://www.ema.europa.eu/docs/en_GB/document_library/EPAR_-_Product_Information/human/000984/WC500021971.pdf. Accessed 6 Mar 2018. EMA. Brilique: summary of product characteristics. 2010. http://www.ema.europa.eu/docs/en_GB/document_library/EPAR_-_Product_Information/human/001241/WC500100494.pdf. Accessed 6 Mar 2018. EMA. Vosevi: summary of product characteristics. 2017. http://www.ema.europa.eu/docs/en_GB/document_library/EPAR_-_Product_Information/human/004350/WC500235373.pdf. Accessed 7 Mar 2018. FDA. Vosevi: prescribing information. 2017. https://www.accessdata.fda.gov/drugsatfda_docs/label/2017/209195s000lbl.pdf. Accessed 7 Mar 2018. EMA. Lixiana: summary of product characteristics. 2015. http://www.ema.europa.eu/docs/en_GB/document_library/EPAR_-_Product_Information/human/002629/WC500189045.pdf. Accessed 6 Mar 2018. EMA. Eliquis: summary of product characteristics. 2011. http://www.ema.europa.eu/docs/en_GB/document_library/EPAR_-_Product_Information/human/002148/WC500107728.pdf. Accessed 6 Mar 2018. FDA. Eliquis: prescribing information. 2012. https://www.accessdata.fda.gov/drugsatfda_docs/label/2016/202155s012lbl.pdf. Accessed 6 Mar 2018. FDA. FDA warns of serious slowing of the heart rate when the antiarrhythmic drug amiodarone us used with hepatitis C treatments containing sofosbuvir (Harvoni) or Sovaldi in combination with another direct acting antiviral drug. https://www.fda.gov/Drugs/DrugSafety/ucm439484.htm. Accessed 17 May 2015. EMA. Epclusa: summary of product characteristics. 2016. http://www.ema.europa.eu/docs/en_GB/document_library/EPAR_-_Product_Information/human/004210/WC500211151.pdf. Accessed 7 Mar 2018. FDA. Atenolol: prescribing information. 2007. https://s3-us-west-2.amazonaws.com/drugbank/fda_labels/DB00335.pdf?1461363666. Accessed 6 Mar 2018. FDA. Ziac: prescribing information. 2007. https://www.accessdata.fda.gov/drugsatfda_docs/label/2007/020186s023lbl.pdf. Accessed 6 Mar 2018. Dutch Medicines Evaluation Board (CBG). Labetalol ratiopharm: productinformatie. 2017. https://db.cbg-meb.nl/IB-teksten/h11106.pdf. Accessed 6 Mar 2018. FDA. Metoprolol extended-release tablets: prescribing information. 2007. https://www.accessdata.fda.gov/drugsatfda_docs/label/2008/019962s036lbl.pdf. Accessed 6 Mar 2018. FDA. Byvalson: prescribing information. 2016. https://www.accessdata.fda.gov/drugsatfda_docs/label/2016/206302s000lbl.pdf. Accessed 6 Mar 2018. FDA. Propranolol hydrochloride extended-release capsules: prescribing information. https://www.accessdata.fda.gov/drugsatfda_docs/label/2011/018553s037lbl.pdf. Accessed 6 Mar 2018. FDA. Sotalol hydrochloride injection: prescribing information. 1992. https://www.accessdata.fda.gov/drugsatfda_docs/label/2009/022306s000lbl.pdf. Accessed 6 Mar 2018. FDA. Capoten: prescribing information. 2015. https://www.accessdata.fda.gov/drugsatfda_docs/label/2015/018343s086lbl.pdf. Accessed 6 Mar 2018. FDA. Vaseretic: prescribing information. 2011. https://www.accessdata.fda.gov/drugsatfda_docs/label/2011/019221s041lbl.pdf. Accessed 6 Mar 2018. FDA. Monopril: prescribing information. 2002. https://www.accessdata.fda.gov/drugsatfda_docs/label/2003/19915se5-037_monopril_lbl.pdf. Accessed 6 Mar 2018. FDA. Zestorectic: prescribing information. 2012. https://www.accessdata.fda.gov/drugsatfda_docs/label/2012/019888s052lbl.pdf. Accessed 6 Mar 2018. FDA. Aceon: prescribing information. 2012. https://www.accessdata.fda.gov/drugsatfda_docs/label/2012/020184s019lbl.pdf. Accessed 6 Mar 2018. FDA. Accuretic: prescribing information. 2013. https://www.accessdata.fda.gov/drugsatfda_docs/label/2013/020125s015lbl.pdf. Accessed 6 Mar 2018. FDA. Altace: prescribing information. 2013. https://www.accessdata.fda.gov/drugsatfda_docs/label/2013/019901s060lbl.pdf. Accessed 6 Mar 2018. FDA. Atacand: prescribing information. 2015. https://www.accessdata.fda.gov/drugsatfda_docs/label/2016/021093s019lbl.pdf. Accessed 6 Mar 2018. FDA. Avalide: prescribing information. 1997. https://www.accessdata.fda.gov/drugsatfda_docs/label/2016/020758s070lbl.pdf. Accessed 6 Mar 2018. EMA. Irbesartan teva: summary of producht characteristics. 2009. http://www.ema.europa.eu/docs/en_GB/document_library/EPAR_-_Product_Information/human/001093/WC500036105.pdf. Accessed 6 Mar 2018. FDA. Benicar HCT: prescribing information. 2006. https://www.uptodate.com/contents/olmesartan-drug-information?source=preview&search=olmesartan&anchor=F9837691#F9837691. Accessed 6 Mar 2018. FDA. Micardis HCT: prescribing information. 2014. https://www.accessdata.fda.gov/drugsatfda_docs/label/2014/021162s037lbl.pdf. Accessed 6 Mar 2018. FDA. Exforge: prescribing information. 2007. https://www.accessdata.fda.gov/drugsatfda_docs/label/2012/021990s017lbl.pdf. Accessed 6 Mar 2018. FDA. Tekamlo: prescribing information. 2010. https://www.accessdata.fda.gov/drugsatfda_docs/label/2015/022545s017lbl.pdf. Accessed 6 Mar 2018. Dutch Medicines Evaluation Board (CBG). Amiloride: summary of product characteristics. 2013. https://db.cbg-meb.nl/IB-teksten/h11128.pdf. Accessed 6 Mar 2018. FDA. Bumex: prescribing information. 2017. https://www.accessdata.fda.gov/drugsatfda_docs/label/2017/018225s026lbl.pdf. Accessed 6 Mar 2018. FDA. Diuril: prescribing information. 2008. https://www.accessdata.fda.gov/drugsatfda_docs/label/2009/011870s040lbl.pdf. Accessed 6 Mar 2018. FDA. Furosemide tablets USP: prescribing information. 2017. https://www.accessdata.fda.gov/drugsatfda_docs/label/2017/018823s044lbl.pdf. Accessed 6 Mar 2018. FDA. Lozol: prescribing information. 2005. https://www.accessdata.fda.gov/drugsatfda_docs/label/2009/018538s028lbl.pdf. Accessed 6 Mar 2018. FDA. Carospir: prescribing information. 1960. https://www.accessdata.fda.gov/drugsatfda_docs/label/2017/209478s000lbl.pdf. Accessed 6 Mar 2018. FDA. Maxzide: prescribing information. 2011. https://www.accessdata.fda.gov/drugsatfda_docs/label/2011/019129s043lbl.pdf. Accessed 6 Mar 2018. FDA. Lotrel: prescribing information. 1995. https://www.accessdata.fda.gov/drugsatfda_docs/label/2017/020364s065lbl.pdf. Accessed 6 Mar 2018. Dutch Medicines Evaluation Board (CBG). Cyress: summary of product characteristics. 2013. https://db.cbg-meb.nl/IB-teksten/h20554.pdf. Accessed 6 Mar 2018. FDA. Cardizem LA: prescribing information. 1982. https://www.accessdata.fda.gov/drugsatfda_docs/label/2015/021392s019lbl.pdf. Accessed 6 Mar 2018. FDA. Plendil: prescribing information. 2012. https://www.accessdata.fda.gov/drugsatfda_docs/label/2012/019834s025lbl.pdf. Accessed 6 Mar 2018. Dutch Medicines Evaluation Board (CBG). Lercanidipine HCL: product information. 2015. https://db.cbg-meb.nl/IB-teksten/h103614.pdf. Accessed 6 Mar 2018. FDA. Nicardipine hydrochloride: prescribing information. 1988. https://www.accessdata.fda.gov/drugsatfda_docs/label/2016/022276s011lbl.pdf. Accessed 6 Mar 2018. FDA. Procardia XL: prescribing information. 2013. https://www.accessdata.fda.gov/drugsatfda_docs/label/2013/019684s026lbl.pdf. Accessed 6 Mar 2018. FDA. Liptruzet: prescribing information. 2013. https://www.accessdata.fda.gov/drugsatfda_docs/label/2017/200153s006lbl.pdf. Accessed 6 Mar 2018. FDA. Vytorin: prescribing information. 2004. https://www.accessdata.fda.gov/drugsatfda_docs/label/2010/021687s036lbl.pdf. Accessed 6 Mar 2018. FDA. Altoprev: prescribing information. 2002. https://www.accessdata.fda.gov/drugsatfda_docs/label/2014/021316s031lbl.pdf. Accessed 6 Mar 2018. FDA. Pravachol: prescribing information. 1991. https://www.accessdata.fda.gov/drugsatfda_docs/label/2011/019898s061lbl.pdf. Accessed 6 Mar 2018. FDA. Crestor: prescribing information. 2003. https://www.accessdata.fda.gov/drugsatfda_docs/label/2015/021366s032lbl.pdf. Accessed 6 Mar 2018. Dutch Medicines Evaluation Board (CBG). Bezalip: summary of product characteristics. 2015. https://db.cbg-meb.nl/IB-teksten/h15982.pdf. Accessed 6 Mar 2018. Dutch Medicines Evaluation Board (CBG). Ciprofibraat Amdipharm: summary of product characteristics. 2016. https://db.cbg-meb.nl/IB-teksten/h111600.pdf. Accessed 6 Mar 2018. FDA. Antara: prescribing information. 1993. https://www.accessdata.fda.gov/drugsatfda_docs/label/2015/021695s012lbl.pdf. Accessed 6 Mar 2018. FDA. Lopid: prescription information. 2016. https://www.accessdata.fda.gov/drugsatfda_docs/label/2016/018422s055lbl.pdf. Accessed 6 Mar 2018. FDA. Durlaza: prescribing information. 2015. https://www.accessdata.fda.gov/drugsatfda_docs/label/2015/200671s000lbl.pdf. Accessed 6 Mar 2018. FDA. Aggrenox: prescribing information. 1999. http://docs.boehringer-ingelheim.com/Prescribing%20Information/PIs/Aggrenox%20Caps/Aggrenox.pdf. Accessed 6 Mar 2018. Dutch Medicines Evaluation Board (CBG). Ascal 38 Brisper: summary of product characteristics. 2014. https://db.cbg-meb.nl/IB-teksten/h21994.pdf. Accessed 6 Mar 2018. FDA. Brilinta: prescribing information. 2011. https://www.accessdata.fda.gov/drugsatfda_docs/label/2016/022433s020lbl.pdf. Accessed 6 Mar 2018. Dutch Medicines Evaluation Board (CBG). Acenocoumarol CF: summary of product characteristics. 2017. https://db.cbg-meb.nl/IB-teksten/h50674.pdf. Accessed 6 Mar 2018. Dutch Medicines Evaluation Board (CBG). Fenprocoumon Sandoz: summary of product characteristics. 2017. https://db.cbg-meb.nl/IB-teksten/h21068.pdf. Accessed 6 Mar 2018. FDA. Coumadin: prescribing information. 1954. https://www.accessdata.fda.gov/drugsatfda_docs/label/2017/009218s017lbl.pdf. Accessed 6 Mar 2018. FDA. Fragmin: prescribing information. 1994. https://www.accessdata.fda.gov/drugsatfda_docs/label/2017/020287s069lbl.pdf. Accessed 6 Mar 2018. FDA. Lovenox: prescribing information. 1993. https://www.accessdata.fda.gov/drugsatfda_docs/label/2013/020164s102lbl.pdf. Accessed 6 Mar 2018. FDA. Heparin sodium: prescribing information. 2008. https://www.accessdata.fda.gov/drugsatfda_docs/label/2008/017029s108lbl.pdf. Accessed 6 Mar 2018. Dutch Medicines Evaluation Board (CBG). Fraxiparine: summary of product characteristics. 2017. https://db.cbg-meb.nl/IB-teksten/h11876.pdf. Accessed 6 Mar 2018. FDA. Arixtra: product information. 2001. https://www.accessdata.fda.gov/drugsatfda_docs/label/2017/021345s035lbl.pdf. Accessed 6 Mar 2018. EMA. Pradaxa: summary of product characteristics. 2013. http://www.ema.europa.eu/docs/en_GB/document_library/EPAR_-_Product_Information/human/000829/WC500041059.pdf. Accessed 6 Mar 2018. FDA. Pradaxa: prescribing information. 2010. https://www.accessdata.fda.gov/drugsatfda_docs/label/2011/022512s007lbl.pdf. Accessed 6 Mar 2018. FDA. Savaysa: prescribing information. 2015. https://www.accessdata.fda.gov/drugsatfda_docs/label/2015/206316lbl.pdf. Accessed 6 Mar 2018. EMA. Xarelto: summary of product characteristics. 2013. http://www.ema.europa.eu/docs/en_GB/document_library/EPAR_-_Product_Information/human/000944/WC500057108.pdf. Accessed 8 Mar 2018. FDA. Xarelto: prescribing information. 2011. https://www.accessdata.fda.gov/drugsatfda_docs/label/2011/202439s001lbl.pdf. Accessed 8 Feb 2018. FDA. NitroMist: prescribing information. 2006. https://www.accessdata.fda.gov/drugsatfda_docs/label/2016/021780s007lbl.pdf. Accessed 7 Mar 2018. Dutch Medicines Evaluation Board (CBG). Isosorbide dinitraat retard CF: summary of product characteristics. 2010. https://db.cbg-meb.nl/Bijsluiters/h56834.pdf. Accessed 7 Mar 2018. FDA. Monoket: prescribing information. 2014. https://www.accessdata.fda.gov/drugsatfda_docs/label/2014/020215s024lbl.pdf. Accessed 7 Mar 2018. (NVZA) NVvZ. Therapeutic Drug Monitoring Monografie. 2018. http://tdm-monografie.org/tdm-monografieen. Accessed 7 Mar 2018. FDA. Cordarone: prescribing information. 2015. https://www.accessdata.fda.gov/drugsatfda_docs/label/2017/018972s053lbl.pdf. Accessed 7 Mar 2018. FDA. Nexterone: prescribing information. 2008. https://www.accessdata.fda.gov/drugsatfda_docs/label/2008/022325lbl.pdf. Accessed 7 Mar 2018. FDA. Digoxin oral solution: prescribing information. 1982. https://www.accessdata.fda.gov/drugsatfda_docs/label/2015/021648s008lbl.pdf. Accessed 7 Mar 2018. EMA. Guideline on the investigation of drug interactions. 21 Jun 2012. http://www.ema.europa.eu/docs/en_GB/document_library/Scientific_guideline/2012/07/WC500129606.pdf. Accessed 14 Feb 2015. EMA. Harvoni: summary of product characteristics. http://www.ema.europa.eu/docs/en_GB/document_library/EPAR_-_Product_Information/human/003850/WC500177995.pdf. Accessed 7 Mar 2018. FDA. Harvoni: prescribing information. 2014. http://www.accessdata.fda.gov/drugsatfda_docs/label/2014/205834s000lbl.pdf. Accessed 7 Mar 2018. FDA. Olysio: prescribing information. 2014. http://www.accessdata.fda.gov/drugsatfda_docs/label/2014/205123s002lbledt.pdf. Accessed 7 Mar 2018. FDA. Epclusa: prescribing information. 2016. http://www.accessdata.fda.gov/drugsatfda_docs/label/2016/208341s000lbl.pdf. Accessed 7 Mar 2018. EMA. Sovaldi product information. 2015. http://www.ema.europa.eu/docs/en_GB/document_library/EPAR_-_Product_Information/human/002798/WC500160597.pdf. Accessed 7 Mar 2018.